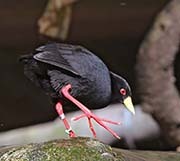 The Black Crake is in the rail and crake family. It is found throughout sub-Saharan Africa. 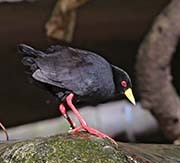 It is black with red eyes, yellow bill and red legs and feet. Both sexes are similar but the male is slightly larger. Juveniles are more brown and gray, the bill is more greenish yellow and the legs and feet are a duller red. The Black Crake may be hunted for traditional medicines but it is considered of 'Least Concern' by the IUCN. This is partly because of its large range and it has benefited from deforestation. It may be hunted for traditional medicines. 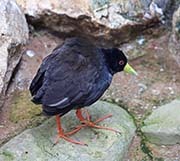 Diet: The Black Crake feeds during the day and in the open. Their diet is varied. Besides eating invertebrates (worms, molluscs, etc. ), they will eat small fish, frogs, seeds, eggs and nestlings of other birds, and will scavenge on carcasses. They will also perch on hippopotamuses and warthogs and remove and eat the parasites. 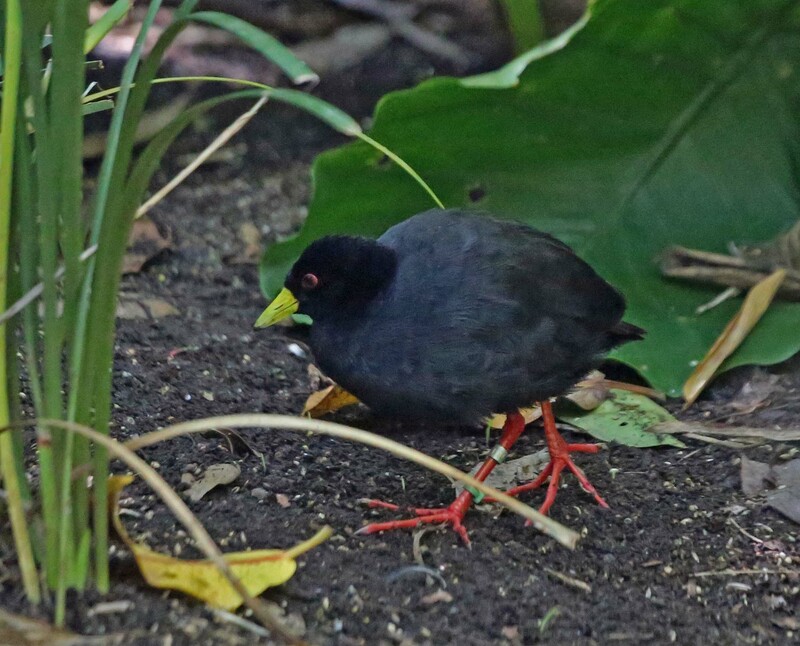 Courtship: The Black Crake may breed throughout the year if conditions are favorable They are extremely aggressive when breeding and will attack other bird species and especially other rails. When attacking other rails as large as themselves they will kill them. Courtship behavior includes feeding and mutual preening, bowing displays and wing movements. It is also more vocal during breeding season. Nesting: The nest is made by both sexes and is shaped like a deep bowl. It is made from aquatic plants and it can be floating on or suspended above the water, placed on dry ground or in a bush. The female lays 2-6 eggs and both parents and juveniles from previous broods incubate the eggs. The chicks are semi-precocial and are fed by both parents and others. Habitat and Range: Black Crakes are found throughout sub-Saharan Africa where there are wetlands that have vegetation cover. For example, lakes, ponds, reservoirs, and along rivers. In more open areas it may inhabit broad, grassy marshes and will occupy very small streams with little cover in drier regions. 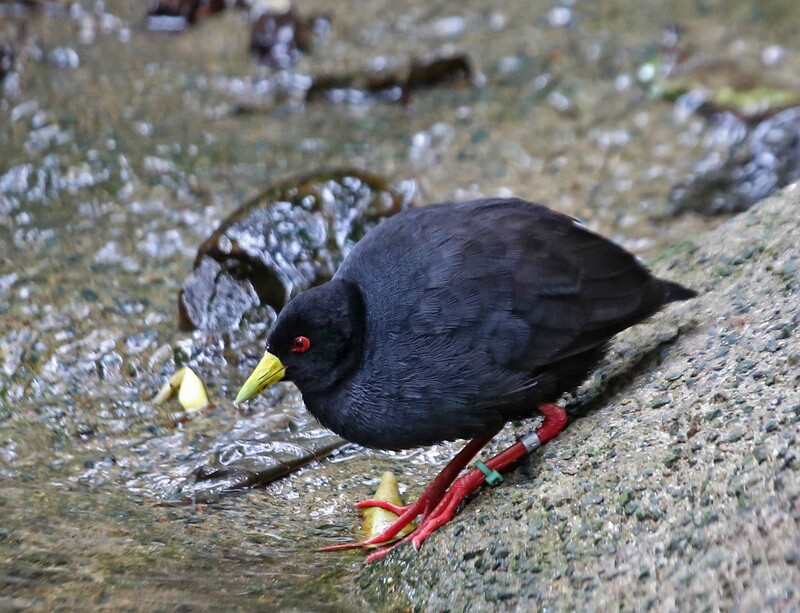 Vocalization: The main call of the Black Crake is a duet, starting with a throaty chattering krrrok-kraaaa. The response is a dove-like cooing coo-crr-COO. Plumage/Molt Black Crakes do not have an alternate or breeding plumage though their legs are more red during breeding. They molt annually and may be flightless when they molt their all their flight feathers. Migration: Mostly sedentary but some local migration. May migrate into areas with rains or flooding. 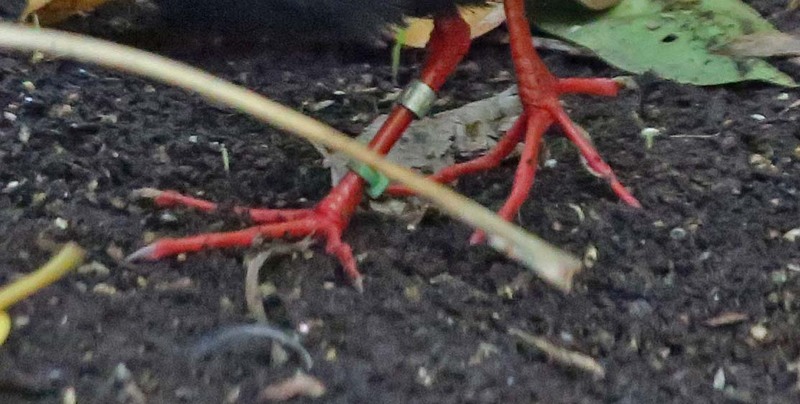 Tongue/feet: Because of its long toes, the black crake is able to walk on floating vegetation.